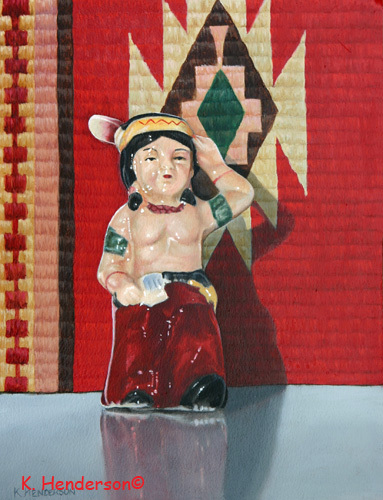 In Disguise is a commissioned painting. It is 36 x 30, oil on canvas. 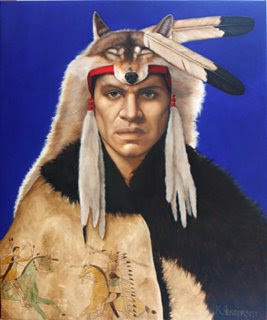 The Plains Indian warrior wears a Wolf Headdress with eagle feathers. 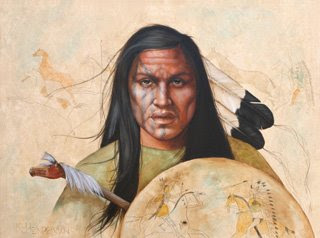 His buffalo robe shows a painting of two warriors in battle. The buffalo robe had many uses. One of them was for a disguise. When a rider was on horse back covered with the robe he resembled a buffalo when seen from a distance. The wolf headdress served the same purpose. The headdress was often used by scouts to disguise themselves. Red Dawn is oil on canvas, 30 x 40. 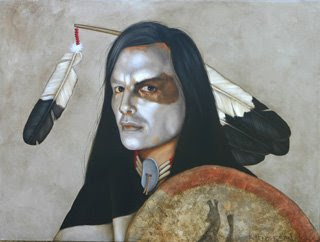 The Plains Indian Warrior has his face painted black and white, wears a black and white blanket, and carries a shield with a bear on it. 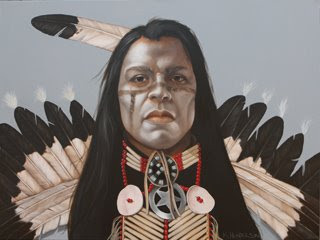 He has eagle feathers in his har. The background is a stormy gray. Horse Nation is oil on canvas, 30" x 40". 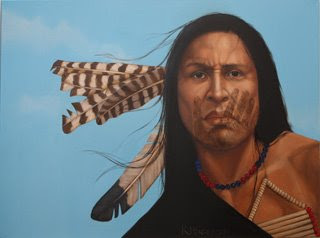 The plains indian warrior stands in front of a painting on buckskin which show riders capturing wild horses. The shield he holds depicts two warriors fighting on horseback. His face is painted in red and blue black. The horse dance stick has red paint and gray horse hair. With Wind and Time is an oil painting on canvas, 3o” by 40″ . It shows a plains Indian warrior wearing a bone breast plate, red and blue beads, eagel feathers and a black blanket . The painted hand on his face shows that he has ‘counted coup’ or touched an enemy in battle.